Welcome to "La Isla del Sol"! Thanks to its 300 days of sunshine all year round, Mallorca is an island of extraordinary charm, and appeal, in all seasons. Even in winter, to escape from the cold. Majorca is the largest island in the Balearic archipelago. A real tropical paradise in the Mediterranean Sea. Wonderful beaches. Suggestive bays and inlets. Crystalline sea. Romantic landscapes. Parks and nature reserves. A hinterland to be discovered, with its remains of prehistoric, Roman, medieval and modern times. And of course, Palma de Mallorca, the capital famous all over the world for its vibrant nightlife. All this makes the Spanish island a truly magical place, as well as a perfect destination for any type of traveler; families with children, couples looking for privacy or young people looking for nightlife. Naturally, during the months of July and August, many tourists are attacked, mostly Germans, British and Italians. Precisely for this reason, May, June and September could be the best compromise to enjoy all the beauties of this magical island. Theplane It is undoubtedly the fastest, most convenient and cheapest solution to reach the Balearic Island. Son San Joan Airport is only 9 kilometers from the city center. It is the third busiest airport in Spain after Madrid and Barcelona, ​​and is well connected to the rest of Europe. It runs all year round, and in the summer months, the advent of low-cost companies and a significant amount of charter flights from Europe make this island one of the most visited destinations in the Mediterranean. Outside the Terminal, buses leave daily to the center, the port, and numerous points of interest throughout the island. The ticket price varies depending on the destination, from a minimum of € 5,00 to a maximum of € 12,00 per person. All info, timetables and connections are available on the our official page, from this link. 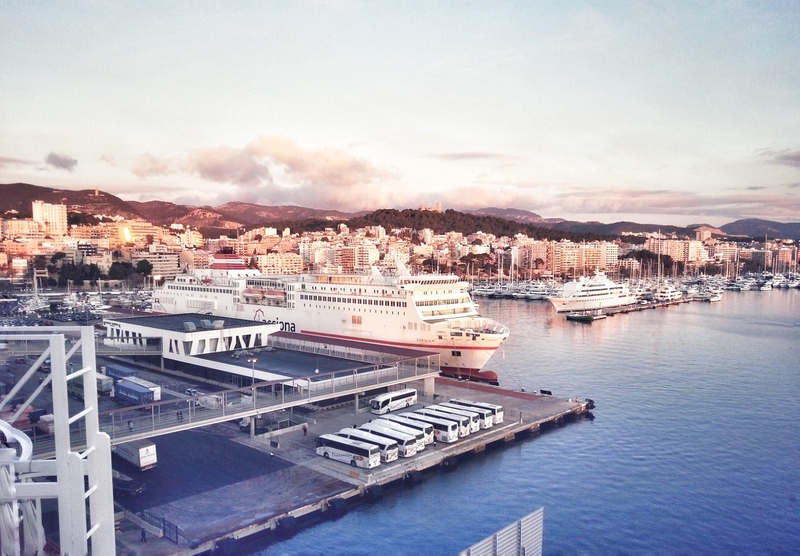 Most ships, including cruise ships, dock at the port of Palma de Mallorca, about 4 kilometers from the center. There are frequent and fast connections between Mallorca and the other Balearic islands of Menorca, in the north-east and Ibiza in the southwest. In addition, several routes are available directly from some ports in Spain such as Barcelona, ​​Valencia and Denia on the east coast. Baleària is the main naval company, which guarantees around 10 daily connections, with travel times starting from 90 '. The bus n.1 connects the open with the center and the airport. The ticket is purchased on board, at the cost of € 5,00 per person. The service is active from early morning until late at night, with a frequency of around 15 '. Alcúdia is the second port of the island, smaller than the main one. In general, from here, ships with short routes from the Balearic Islands mostly dock. A trip on the road, which includes several stages, could be a rather suggestive solution. The ideal would be to reach the beautiful Barcelona and, from here, embark their car to the beautiful island. In general, loading a utility car with a length of less than 4 meters, from Barcelona, ​​costs about 70,00 €, one way.